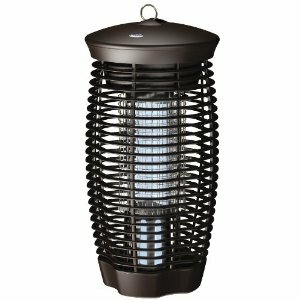 High-impact polycarbonate plastic housing with UV blacklight that attracts phototropic insects and lures them into killing grids. Once inside the killing grid, power from high voltage transformer quickly and efficiently eliminates flying insect. Unit should be placed 25-foot to 50-foot away from house or areas of human activity and at least 6-foot to 8-foot off the ground. Required maintenance is annually replacing the UV black light and periodically cleaning the killing grids. CUL and CSA listed. Plugs into 120V outlet.